Nick Stepney is one of a number of keen cyclists at Guilford Textiles. Nick Stepney, 32, works as a production planner for Alfreton-based Guilford Textiles. "We have had about half a dozen people who have been involved in the Summer of Cycling Challenge at Guilford during August. It started out with a couple of people just doing it as part of their normal exercise routine and then encouraging others to join in. 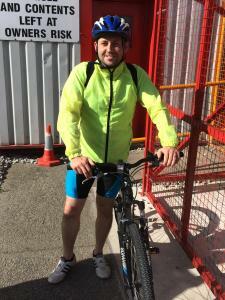 "When another member of staff brought the Workplace Challenge to our attention, quite a few have got involved by cycling to and from work and also keeping up their points levels by getting out in the evenings and at the weekends as well. "It's been a good way not only to keep fit but also build morale within the business because we have people from various departments in what is quite a big place taking part and it is helping us to have a bit of fun while getting fit. "If we can put ourselves in the frame for winning a prize at the end of it too then that is great. "We all have a bit of banter trying to beat each other and since this has come into place, especially since the August challenge, people have increased what they have been doing, particularly outside work. There's also the incentive of not wanting to let your work-mates down. "Personally I have struggled for time to get out and do more sessions but I have varied the route I take home from work which is four miles at its shortest but I now add distance on. "It's not just the cycling either, but more people have started running, swimming or walking too and it means we will be ready to give the September Challenge a go. "We have put the message out through our newsletter and people have really responded well and it has quickly gathered momentum. "It has made me keener to beat my times and go that bit further. I'm now also looking to join a gym in Alfreton and my wife is also looking to come along as well. It has made me want to adopt a more healthy lifestyle."